Q: Have negotiations been suspended? A: No, FUNSCAD negotiators continue to be available any time the Employer indicates a willingness to return to the bargaining table. Q: Is it legal for the University to shut us out of our email accounts? A: It is not illegal for them to shut us out of their server. We checked that. Q: Is it legal for the University to shut us out of the employee section of WebAdvisor, where our pay information and T4 and T4A slips are released to us? A: No, it is not legal. We had been given to understand that Unit 1 members would have limited access to Webadvisor so that people could get their T4s. Full time faculty and RPTs wanting to access their financial records on WebAdvisor will need an individual pin number. Any members who would like to access their T4’s will need to contact Tim McInnes for their personal pin number. Or you can call the Finance Office and ask for them to mail your T4 to you. Q: Is it legal for the University to shut us out of our intellectual property on Brightspace? A: Brightspace is on the employer’s server, so they can block whomever they want to. We would hope that anyone using BS keeps a copy of work that constitutes intellectual property. The University owns the platform, and controls access to it. They don’t own your intellectual property, however, so they should not use material you’ve put on BS to run a class without you. Q: What if I get an email from a curator, a gallery, a granting agency/ journal editor/ scholarly association during the strike? Can I respond? A: Yes you can. We recommend that you advise them that you are on strike, and, as a result, you will not do reviews or assessments during the period of the strike and will likely not be able to meet any deadline that falls within a period of work stoppage. 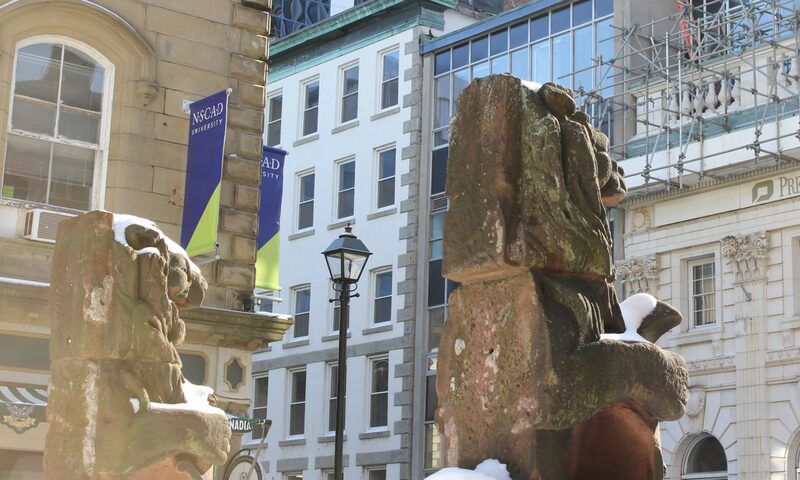 However NSCAD has also decided to cut off our access to emails so if something professionally important comes to you on your nscad email (as many of us have reason to expect will happen), you won’t be able to get that message or do anything about it. FUNSCAD suggests contracting parties you might be expecting to hear from and explain you are on strike. Q: What about grant funding? A: The Employer has indicated that all external and internal grant funds will be frozen in the event of a strike. Please let the Union know if this creates a hardship. Q: I am on sabbatical, what do I do? Q: Do we have health, eyecare and dental benefits (along with our family members if they are covered under our plan)? A: Yes. Everyone in the plan has continued health and dental benefits because the Union is paying the full cost of those benefits. The Union may cover the costs of the premiums for all affected employees for up to six months from the date of the work stoppage. Q: What about health insurance while traveling? Maternity benefits? Long and short term disability? People on sabbatical? Travel Insurance: There is no continuation of benefits as of the first day of the strike. We recommend members purchase their own. Life, and Optional Life: Benefit coverage would be deemed to continue until the end of the month next following the month in which the work stoppage began, provided the required premiums are paid by the Union. stopping, including a waiver of premium for life insurance. Accidental Death and Dismemberment: There is no continuation of benefits as of the first day of the strike. Maternity Leave Top-up: Their position is that the maternity leave top-up is a collective agreement provision and the Collective Agreement is suspended in the event of a strike. Sabbaticals: The administration decided to assume that sabbaticants are also on strike, and is therefore not paying them. The Union is suggesting ways in which these people can participate from afar so that we can give them the strike stipend. Q: I saw Professor Irving cross the picket line this morning. Should I report them to somebody? Write them an angry email? A: FUNSCAD would deeply regret the actions taken by Professor Irving as they would be actively undermining what the strike is intended to achieve: a decent and fair settlement. If you feel comfortable engaging with Professor Irving and telling them about FUNSCAD’s issues, please feel free. Of course, any such engagement must be done respectfully and civilly. FUNSCAD does not endorse reprisals of any kind against any member of the bargaining unit for any reason. Q: I am a Unit II technician and also an RPT, I understand that I will be withdrawing my teaching but do I continue working as a technician? A: Yes, only your teaching is covered by the Unit I Collective Agreement so you have to continue working as a technician. You can join the picket line when you are not working as a technician and you should not perform any of the duties that are part of your job as an RPT. Q: I am an RPT but also teach in Extended Studies, Do I stop teaching those classes as well? A: No, Extended Studies teaching is not work covered by the Unit I Collective Agreement, you must keep on carrying out those work responsibilities.